Santa Lucia, also known as Playa Santa Lucia, is located on Cuba’s north coast in the geographic center of the country. 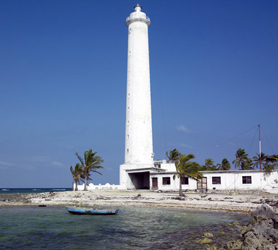 Santa Lucia is detached from the island of Cayo Sabinal due to the La Boca canal, a slim sea estuary which leads into the larger Bahia de Nuevitas (Nuevitas Bay). Seen using satellite imagery, Playa Santa Lucia would have been an island had the lowlands between the aforementioned Bahia de Nuevitas and Bahia de Nuevas Grandes (further east) been just 30 meters lower than they currently are. 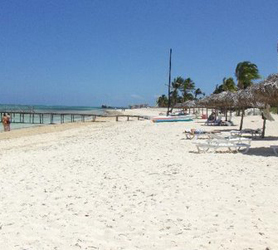 Therefore, while not an island, Santa Lucia is as close to being part of the Jardines del Rey Archipelago as any Cuban mainland destination could be. The obvious benefits of the location are, easy road access from Camaguey (population 330,465) and the same coastline and reefs that make the Jardines del Rey Islands so attractive to tourism. The town of La Boca is a small seaside town, with less than 2000 inhabitants, perched on the northwest coast of Santa Lucia at the limit of the sea estuary. There are no tourism installations in the town, although it is a popular place to visit from the Playa Santa Lucia Hotels which are around 10 km further down the coastline. At the start of the hotel zone there is an airport called Joaquin de Aguero Airport or NLU, also known as Santa Lucia Airport. The airport is being updated to permit direct flights from international destinations such as Canada and Europe. The update underway will extend the runway for larger planes and also incorporate the building of a new terminal. Santa Lucia as part of a tour of Cuba? Due to its easy mainland access and multiple entry points to Cuba’s 1435 km Carretera Central (Central Highway), the main road artery that runs through the center of the country, Santa Lucia is a favorite destination for those looking to add a beach destination to a broader tour of Cuba. Located between Camaguey and Las Tunas, it takes just 1 hour to transit the minor roads from the Central Highway at Camaguey to get to the resorts along the 21km (13 miles) beach of Playa Santa Lucia. Departing again from Santa Lucia, road trip vacationers often continue their tour of Cuba by taking the alternate route southeast. This passes through Puerto Padre (see image below) in Las Tunas then leads onto Holguin and beyond. In fact, it’s quite feasible to use Santa Lucia as a stopover point, halfway through a Cuba road trip, before contemplating the final 286 km (178 miles) to Santiago de Cuba. Contact us via chat for our unique Cuba Road Trip Package. Even though there are no direct flights, to give an idea of just how close Santa Lucia in Cuba is to The Bahamas, the Clarence A. Bain Airport (MAY) in the Bahamas is just 301 km (187 miles) from Joaquin de Aguero Airport or Santa Lucia Airport (NLU). With regard to the United States of America, Key West Florida is just 356 miles (572 kilometers) by flight from Playa Santa Lucia. Tags: Carretera Central Cuba, Distance Camaguey Santa Lucia, Distance Havana Santa Lucia, Distance Holguin Santa Lucia, Distance Varadero Santa Lucia, Geography Santa Lucia Cuba, Getting to Santa Lucia Cuba, Roadtrip Cuba, Where is Santa Lucia Cuba Located? Posted in Where is Santa Lucia Located? | Comments Off on Where is Santa Lucia in Cuba? Just a 20 minute boat ride from Playa Santa Lucia is the island of Cayo Sabinal. An important historically relevant island due to the Spanish presence and fortress present there. Faro Colon (Christopher Columbus Lighthouse) is Cuba’s tallest lighthouse, located on the north coast of Cayo Sabinal its an omnipresent reminder of Spanish rule on the island of Cuba throughout the 19th century. The Columbus lighthouses focal length is 53 meters (174 feet). It employs a white light which flashes every 15 seconds. Next door to the lighthouse is the one storey light keeper’s dwelling. There’s a local legend which claims that Punta de Maternillos is a place of immense buried treasures and great riches left by wayward pirates. The Columbus lighthouse (Faro Colon) was built in 1847 as observation post, the lighthouse beacon a savior for sailors passing through the treacherous Bahamas Channel on their way to Havana, Florida and Mexico. Further along the coast on Cayo Sabinal is the fortress of San Hilario that served as a fortified tower and barracks for Spanish artillery and troops, Built to defend against repeated pirate attacks in the 17th and 18th centuries, the fort kept marauding corsairs at bay. The San Hilario fort later became a prison and, in 1875 was used as a base for a brief uprising against the Spanish queen, Isabel II, in Cuba. This whole day excursion from Hotels in Santa Lucia is a great history lesson. It provides a deeper understanding of Spanish rule on Cuba plus, there’s some impressive historic buildings and, of course, the beautiful Island of Sabinal in the Jardines del Rey Archipelago. Even though you’re probably at an all-inclusive resort in Santa Lucia, there may be one night you fancy something different. The Bucanero Restaurant is located a short distance from the hotel area of Playa Santa Lucia at Playa Los Coquitos, about a 10-20 minute walk from the hotel zone. 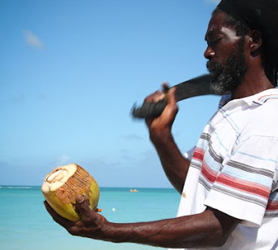 We like this restaurant because it serves fresh fish (local catch) along with the Cuban staples of Creole dishes, including delicious black beans and rice with either marinates chicken or pork. 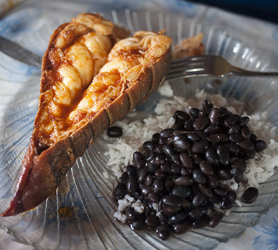 Most of the resorts along the Santa Lucia Coastline serve lobster rarely, if at all. At the Bucanero Restaurant you can order the succulent garlic butter adorned gigantic lobster for just 22 CUC. There’s always a live trio playing and dancing salsa is a must. The ambience is truly authentic and its worth taking time-out from your resort for a nice meal at the Bucanero Restaurant in Playa Santa Lucia. Taking an excursion from your All-Inclusive hotel in Playa Santa Lucia to Cayo Sabinal’s virgin beaches is like visiting another country. 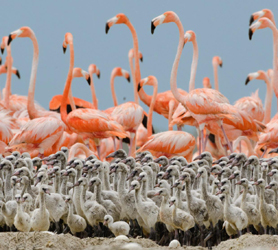 This virgin island is home to large colonies of Pink Flamingos who have made the island their home due to its abundant fauna and excellent feeding possibilities. Thousands of birds flock to the island in barren areas along the empty beaches while feeding in the saltwater lakes. Due to the virgin nature of Cayo Sabinal we urge visitors from Santa Lucia to take ample mosquito repellant when visiting Cayo Sabinal. The excursion begins by collecting participants at their respective hotels show on our website. Collections begin at 8.am so please be at the reception of your hotel by then. The cost of the tour, sold at the below hotels is 40 CUC for adults and 19 CUC for children and includes lunch. Setting off from the port of Santa Lucia Beach, the comfortable motor yacht offers ample room for all 24 people. Jetting across the blue Jardines del Rey waters you’ll be able to see flying fish and schools of wild dolphins. After arrival at Cayo Sabinal you’ll be able to snorkel for an hour from the boat or walk to shore through the warm shallow waters. Once on shore, our guide will take you to the Fort San Hilario and Faro Colon, we then progress down the coast to the Flamingo and Iguana Sanctuaries. These majestic birds are unfazed by human presence, as they strut elegantly through the waters, feeding on tiny crustaceans and marine life. Nearby you’ll experience one of only a few Dolphin sanctuaries, seeing these beautiful mammals nursing their young and playing in the sea is an almost spiritual sensation and one you will never forget. The tour departs back to the Playa Santa Lucia port at 4pm, arriving back by 5pm.